Lush Fab Glam Inspired Lifestyle For The Modern Woman: Fashion Collaborations:﻿ Alicia Keys For Reebok 2013. Fashion Collaborations:﻿ Alicia Keys For Reebok 2013. 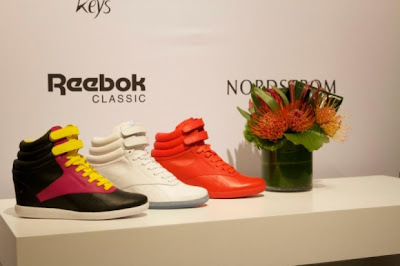 Singer Alicia Keys continued her collaboration with the sports shoes and sneakers brand Reebok by releasing her Spring 2013 Wedge Sneakers collection. The bright and multicolored sneakers are a great way to dress down when paired with skinny jeans and are perfect for creating a comfortable and casual spring/summer look. 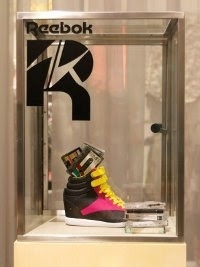 The Alicia Keys for Reebok Wedge Sneakers comes in three styles; a bright and vivacious red Freestyle Sneaker, a black, pink and yellow color block Chi Street Pack and the Classic Iridescent Pack inspired by Alicia's stage life. Each sneaker retails for $90 USD. She said, "The Freestyle has always been a part of my style—so I'm really excited to give it even more of an edge. I'm feeling deeply inspired this year with the new album, tour, and everything that's going on in my life. Creativity is limitless in its possibilities and I love that I get to express myself in a whole new artistic way through the design of these collections." Do you wear wedge sneakers and what do you think of Alicia Keys 2013 Reebok collection? Leave a comment below. in which I'd like to ask if you do not mind. I was interested to find out how you center yourself and clear your thoughts prior to writing. I have had a tough time clearing my thoughts in getting my ideas out. I do take pleasure in writing but it just seems like the first 10 to 15 minutes are generally wasted just trying to figure out how to begin. Any ideas or hints? Thanks! Thanks for your marvelous posting! I truly enjoyed reading it, you're a great author. I will be sure to bookmark your blog and will come back very soon. I want to encourage you continue your great posts, have a nice afternoon!